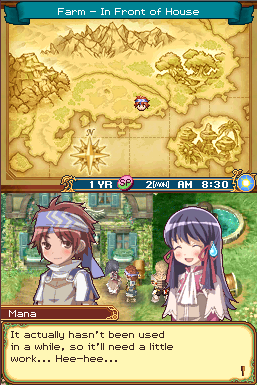 Rune Factory: A Fantasy Harvest Moon2 continues very closely in the themes set by the original Rune Factory. Get a farm, help the townspeople, and make some cash by growing crops and plundering the dungeons. In fact, it’s almost exactly the same formula. What is different, however, is the fine tuning of some small things. The controls are more fluid, all the dungeons are available right from the start, and a new element is introduced to occupy your time: quests. A bulletin board is used for you to accept quests on behalf of the townsfolk, and this serves to help you net some extra rewards. This also increases your friendship and love ratings with the town, whereas before you had to give lots of gifts and talk to them. Here is also where the story is progressed, which is a much larger part of this game compared to the previous title.The same things you love from the first game return in force to the sequel, and the quest system a very welcome upgrade from the first game. This provides plenty of diversion from the main game. 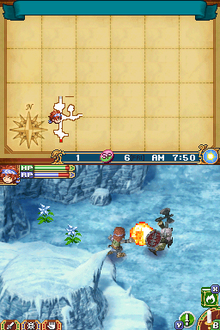 Returning is also the combat and magic system from the first game. One difference is that some of the skills are not available until later in the game. This is explained by saying that the materials do not exist and the character has not learned those skills yet. These skills include cooking, smithing, pharmacy, and crafting, and are unfortunately very critical skills to getting the most out of dungeons. Unless you have the patience to max out your combat skills (I did do this in one playthrough) you need upgraded weapons and potions. This leads to one of the main critiques of the game: it seemed like an interesting plan to delay certain skills in order to fit in with the ‘second generation’ portion of the game, but it ends up seeming like a punishment. Speaking of the ‘second generation,’ this is a unique instance in the series. Your child takes over for you once he or she grows up. Again it seems like a solid idea on paper, but it ends up forcing you to marry and have a child for the story to progress (no celibate heroes allowed). Your child then is required to go to a school you build in order to learn these previously unavailable skills. And this part really blows. It slows down the pace of the game, especially when you’ve been waiting for the chance to upgrade your smithing. There is also a jump in the difficulty when your child takes over, and this can be a deterrent to some. The opposing camp will claim that the game is too easy for the first half, and no one ends up pleased. The game has many positives however. The dungeons are quite fun and the townspeople are as diverse as ever. There are new girls to woo and the story (once you’re allowed to progress it) actually isn’t too bad. Although this game represents the low point of the series, it makes for a very entertaining game. There are many hours of enjoyment to be had from it and there is always replayability value. Vince started his video game journey when his friend loaned him a GameBoy Color to play while he was stuck at home with chicken pox.